We have just completed the cycle of holidays with Simchat Torah, and are beginning the reading of the Torah cycle with Bereishit, the first Chapter of Genesis. Like a holy soap opera, we are told the story of Creation, introduced to human relationships through Adam and Eve, invited into the Garden of Eden to meet the flora and fauna of the Earth, and learn the consequences of good and evil through the Tree of Knowledge. Before I begin to read this first chapter again, I ask, ‘what have I learned about myself during the High Holidays that I bring into the reading? How am I different this year than in previous years? What surprises might emerge as I study and contemplate the text?’ As Maria, in the Sound of Music sings, “Let’s start at the very beginning, a very good place to start.” So, once again, with beginners mind, I welcome my new interpretation of the oldest text around. I invite you to join me on this journey and reflect on what you may have noticed or learned about yourself during the holidays that informs how you will engage this coming year. As we enter the new month of October and the Hebrew month of Cheshvan, I am hopeful that we can bring renewed hope to healing the divisiveness in our country in the coming year. I would be remiss not to address how difficult these times are for many of us as we watched the Senate hearings and continue to wait for the day of reckoning. Who will fill the vacant seat on the Supreme Court? The lack of compassion, the slanderous insults, the commitment to ideologies keeps me up at night, wondering who we are as a peoplehood. Last week was raw with emotion as I listened to Christine Blasey Ford’s and Judge Brett Kavanaugh’s testimonies. We heard conflicting stories and different truths. Many of us were riveted to the television, making every effort to listen to the testimonies with open minds in spite/in light of our own life stories and biases. Inevitably, it opened wounds for those who have experienced sexual harassment and assault, as well as for those who have held friends and loved ones during their most vulnerable times. What we are witnessing far transcends the political realm. It is about how we treat the ‘other’ betzelem Elohim, in the image of God, with reverence and kindness. Truth, or in Hebrew, Emet, is based on facts and shaded by our perceptions. We can witness the same event or share the same experience, but our descriptions may vary. Each of us can be correct, yet depending on our unique perspectives, our retelling or recollection may sound different because of when and how we tell the story. How many of us are certain of something we witnessed or were told one day and in the next version the ‘facts’ change slightly? It is in part what makes us unique humans. During the High Holy Days we reflected on where we missed the mark, including in our speech. Do we speak from our highest selves relaying the truth with a sense of equanimity and respect? Can we listen to the ‘other’ even when we disagree or disapprove with a compassionate open-heart? I heard a Senator comment, there is an “ocean of pain” in our country. Indeed, there is so much pain, individually and collectively wherever we look. How can this lead us to an opening to repair the brokenness? Throughout the High Holidays, we quoted Leonard Cohen who wrote, “There is a crack in everything. That's how the light gets in.” Yes, we must allow ourselves to feel and name the pain so that we can make a space for difficult, heart opening conversations. At the end of this week’s fact gathering, we know that there will be more questions left unanswered. As in many of life’s situations where there are contradictory sides, what do we do? Who do we believe? How do we move on to address the pain and heal the wounds? How do we bridge the divide that is as deep and dark as the ocean? It is easy to sink to the bottom of the sea and retreat under the rocks. Who of you haven’t considered joining a commune on a utopian island? But realistically, it is during times like this that I want to be right here, in community. I want to reach out and touch someone. I want to sing and pray, listen and laugh, connect and heal. I want to seek the glimmer of sunshine that brings light through the cracks and eventually illuminates the path that will help restore the brokenness in our country. As I ate in the Sukkah for the last time this season, I was reminded of the importance of community. We gather in the sukkah as our place of refuge, of safety, of connection, of welcoming and inclusivity.... just like we do at The Shul of New York. 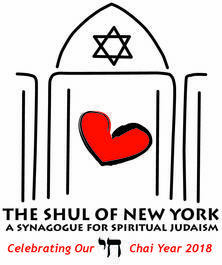 We may be a Shul without walls, an impermanent physical dwelling place, but we do not take for granted that we are a community that is constructed with the values grounded in chesed, loving kindness. We strive to be open-minded and open-hearted....a place you can feel safe to bring your questions, your sorrows and your joys. I hope you will peruse this month’s calendar and join us in celebrating with our community. We have created a variety of programs to bring us together through prayer, learning, contemplation, singing, healing and social events. May we be blessed with the possibilities of new beginnings. May we hold on to the belief in a world that has the potential to be just and kind, accepting and safe. I want you to know that as your rabbi, I am committed to being here with and for you. October 28: 7-9pm Nechama for your Neshama: Comfort for your Soul Join Rabbi Eva and David Zinner in a conversation about visiting the ill, homebound and making shiva visits. Preregister, as space is limited.